My experience as a Bobby Jones Scholar thus far has been extremely challenging but exciting! I completing the MLitt in Classical Studies, and am taking classes in Greek, German, and the Classics core module for that program. I am particularly interested in the art and architecture of the Hellenistic and Early Imperial periods, and hope to incorporate these topics into an archaeologically focused masters thesis. This semester I am beginning a directed reading that will hopefully culminate in workshop on Numismatics at the British School in Athens, Greece. Moving to Scotland from sunny Atlanta has been quite an adjustment, but I am loving the scenery and history of St Andrews. Last semester I had the chance to visit both Edinburgh and London with the other “Bobbies” and also made a solo trip to the Louvre in Paris to observe the conservation of the famous Winged Victory statue. In April I will be presenting at the annual meeting of the Association of Art Historians about previous research on the polychromy of the Parthenon frieze. Each year the Robert T. Jones scholarship and fellowship allows five graduating students at Emory University in Atlanta, Georgia and St Andrews to switch places for a year. Many of the students coming from Emory pursue a one year masters degree at St Andrews. 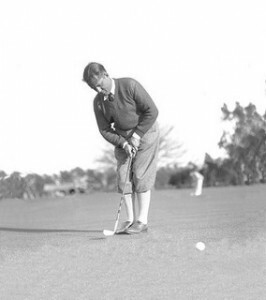 The scholarship is named after the great Atlanta-born amateur golfer Bobby Jones, who had a very special relationship with the town of St. Andrews.